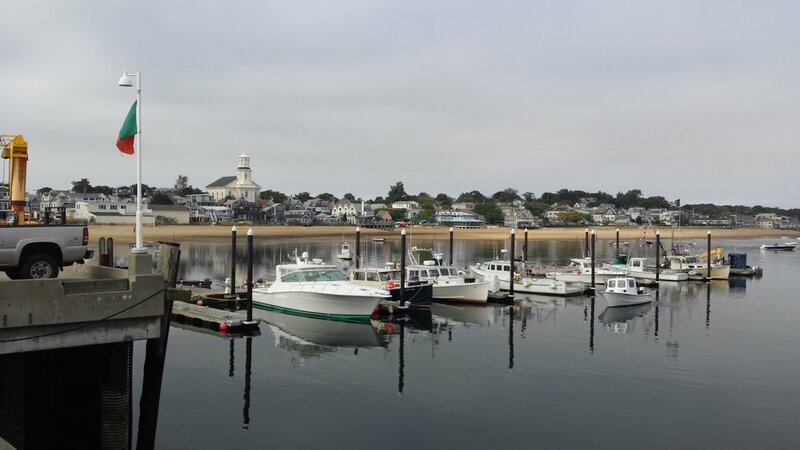 We were ready to leave Connecticut behind and find our way to a slower pace on Cape Cod. Fueled and filled up from a great breakfast, we were making good time until we hit Boston. Traffic slowed considerably and, needless to say, we didn't beat the Friday crowds to the Cape. 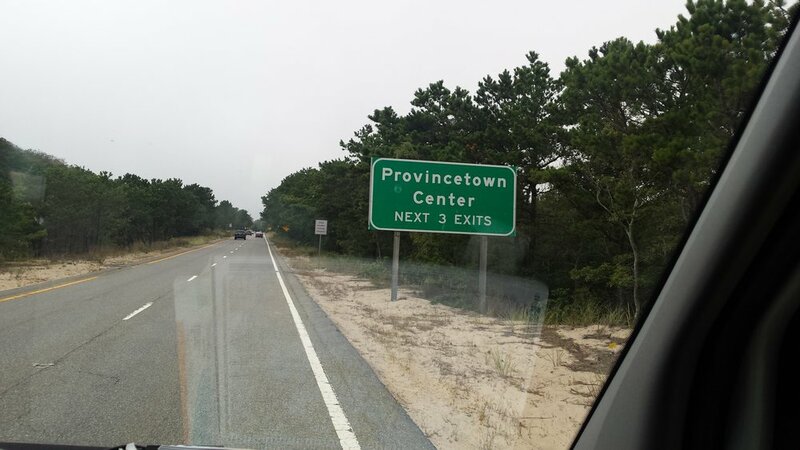 And, once on the Cape, we had to choose the best route to Provincetown. The more scenic route is on the eastern side of the Cape with all the coastal villages. The western route is more direct but pretty much a drive through salt marsh and beach forest. Since we wanted to make camp and get to see Provincetown before dark, we opted for the faster, less scenic route to our campground. 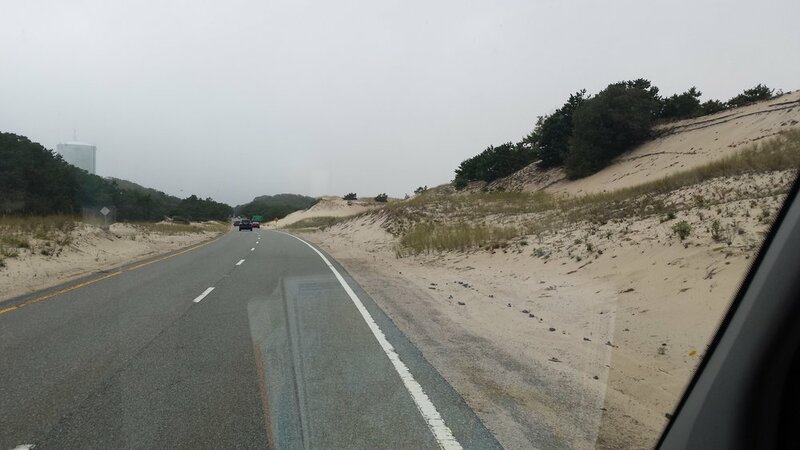 The further out on the Cape we drove, the lighter the traffic, and we soon found ourselves driving alongside the towering sand dunes of the National Seashore. 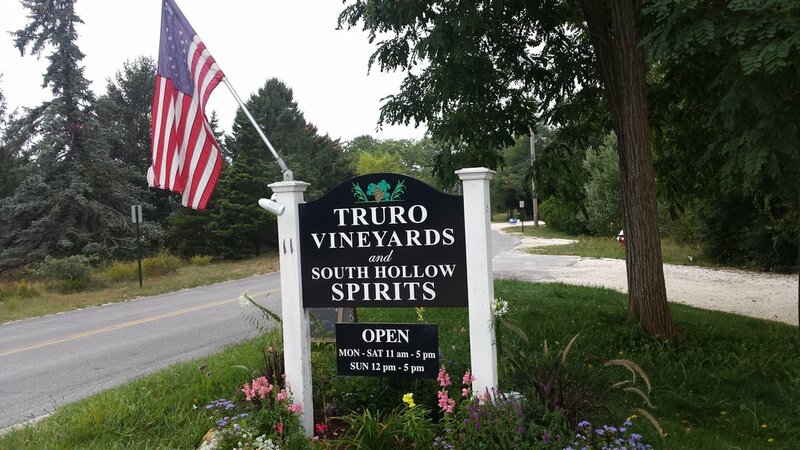 We passed through a few towns, including Truro, which had a great looking vineyard within view of the road. I made a mental note to stop in while we are here. Just a few more miles and our campground sign appeared. It sits back in the dunes on a steep hill and, as we drove in, I wondered if our RV would fit on the narrow camp road. No worries though, we had reserved a site near the entrance and that made it easy to get in and out for touring the area. The campground itself is pretty basic, but quiet and nestled in the dune forest. It is owned by the Trustees of Reservations, an organization dedicated to preserving properties of exceptional scenic, historic and ecological value for public use and enjoyment. Our site was part of a terraced set of sites in the trees. The manager checking us in mentioned that we might want to walk into town and get bikes. There is no parking to speak of, and the roads are quite narrow - looking at our little RV he said, "even that size won't make it in downtown Provincetown". We heeded his advice and, after setting up camp, we walked into town to look for the bike rental and find dinner at one of the popular restaurants. The walk into town was short, but with no sidewalks and very narrow streets, we found ourselves dodging cars the whole walk. Finally, we arrived at the main street. It was mobbed with people, and cars weaving in around the crowds. Crazy. We walked through the melee to the beach - a much safer pathway. We walked along the sand to the MacMillian Pier at the heart of downtown. It is home to the ferry to Boston, charter fishing boats, and wildlife watching tour boats. There are also a few artists booths with photographers, painters, and jewelers showing their wares. At the end of the pier is a Pirate Museum, but what caught my attention was the old boat shed in the distance. It had wall-sized photographs of several women. I had seen pictures of this building in a magazine and recognized it immediately. 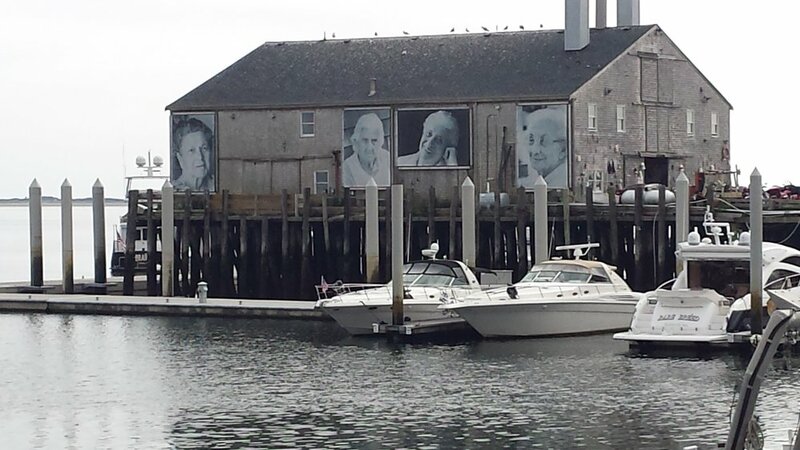 Titled, "They Also Faced The Sea", by artist Ewa Nogiec, the five larger-than-life black and white photos of Provincetown women of Portuguese descent, are mounted on a building at the end of Fisherman's Wharf. The women, Almeda Segura, Eva Silva, Mary Jason, Bea Cabral and Frances Raymond, are meant to represent all of the women of Provincetown, whose families made significant contributions to the history and culture of Provincetown. The art installation is a tribute to their strength and courage. The huge images of those expressive faces were captivating and I stood there a long time reflecting on them. Jim reminded me we were looking for a restaurant, so we redirected our stroll back to the main street. Our campground manager suggested the "Lobster Pot" which he admitted was a bit touristy, but the food is very good. Getting hungry and not knowing the area, we took his advice and found a table there overlooking the harbor. The manager was right. It was very crowded, but the food was excellent as was the service. After dinner, we decided to walk around the town away from the crowds and soon found ourselves at the Pilgrim Monument. 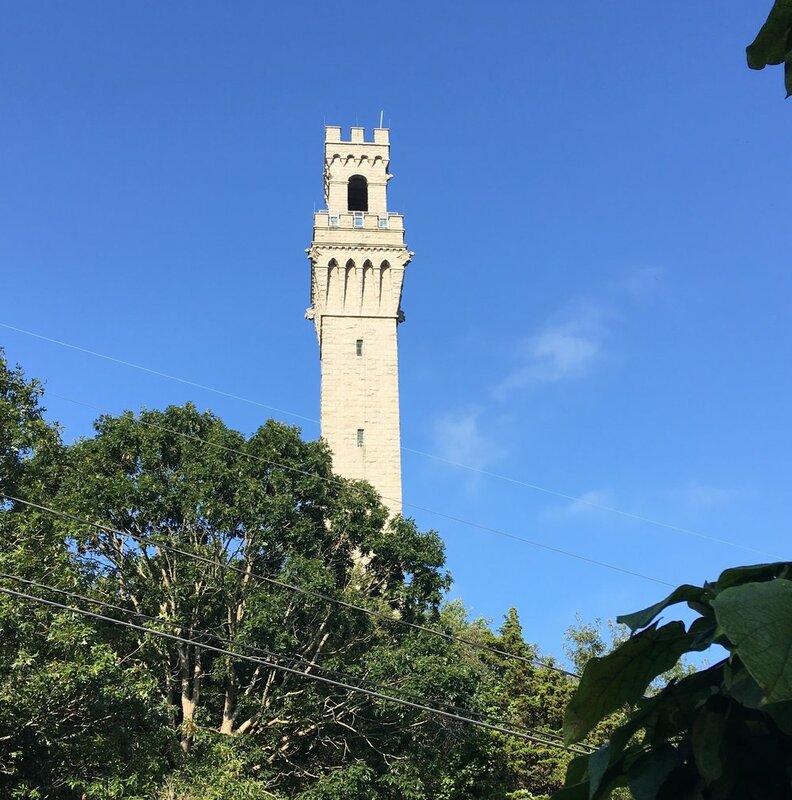 Founded in 1892 as the Cape Cod Pilgrim Memorial Association, its purpose is to commemorate the Mayflower Pilgrims’ first landing in the New World in Provincetown, in November 1620. The Pilgrims spent 5 weeks exploring the tip of Cape Cod before they sailed on to Plymouth. They also drew up and signed the Mayflower Compact, which established the rule of law for the new land. Too tired to walk back to the campground or find the nearest bike rental, we decided to try "uber". It was so easy! We followed the app and watched "Steve" make his way to our location. He was quite personable and made the experience comfortable. Back at the campground we settled in for the night and planned our trip to the National Seashore for the next day. The morning was overcast but quite warm, so after breakfast, we buttoned up the RV and headed out. The drive only took about ten minutes to the National Seashore Visitors Center. 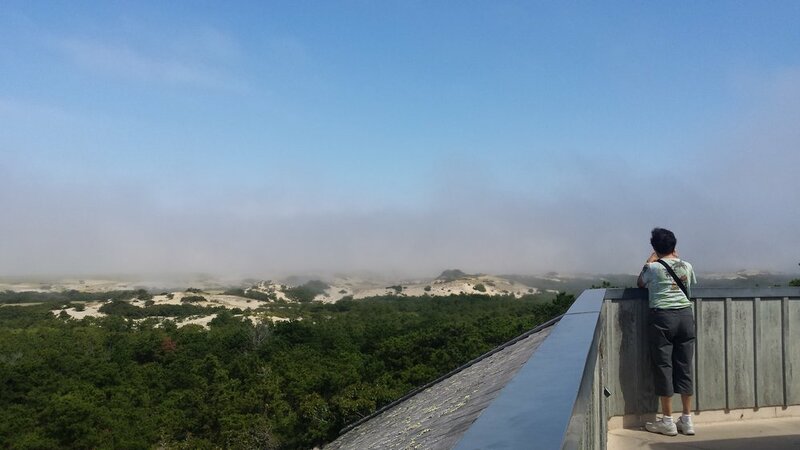 We climbed to the observation deck to view the dunes and seashore beyond. The dunes are massive. More like foothills than sand dunes. They make up about 8,500 acres from Chatham to Provincetown and began forming after the glacial retreat. The morning we were there, the dunes were shrouded in a heavy mist and looked quite dramatic as the fog rolled in and settled into the dune forest. The area is quite wooded but there are paved bike paths throughout the dune forest. Hiking or biking the paths is a great way to see the whole area. We made our way to the beach heading through a cut in the dunes to the shore. 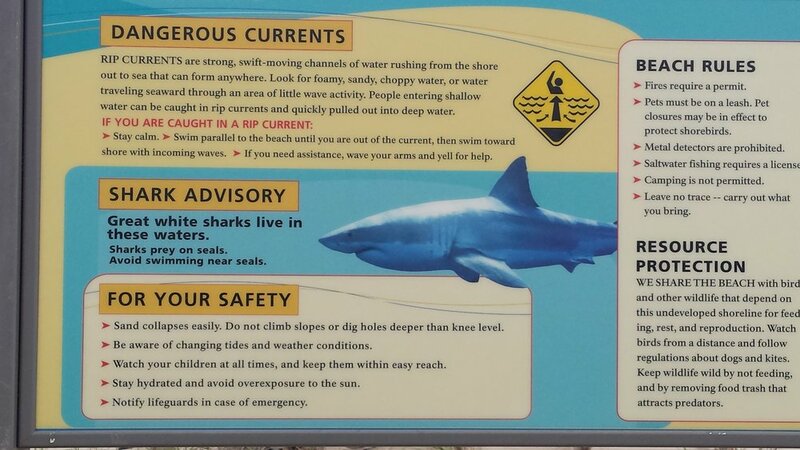 We were stopped short by a sign warning about great white sharks in the area! It gave safety instructions for swimming and kayaking. No need, I don't think we will go in the water this trip! The surf was rough, and the dense fog had settled on the water. It was hard to see more than fifty yards out to sea. What we did see was what we thought was a person swimming. Then, as he got closer, we realized it was a seal! He cruised down the shoreline looking for his next meal. Seals are a great white shark's favorite food, so he had best beware- The sign said so! We toured the rest of the park, enjoying the dunes and the forest views, then headed to the nearby town of Truro to see the Highland Light Station. 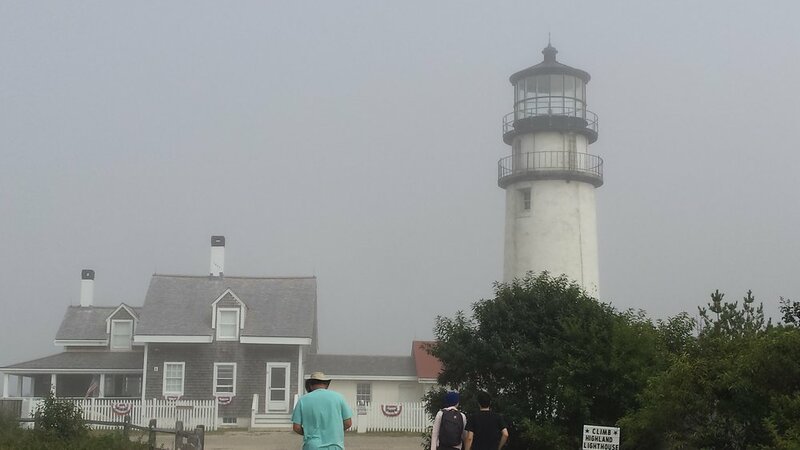 As we arrived, the heavy mist we encountered on the dunes remained wrapped around the lighthouse. We walked down a sand and gravel path to the Light, passing a museum and a golf course along the way. (That would be an interesting round of golf with all that fog!). Also known as the Cape Cod Light, the area is part of the National Seashore. The original 45-foot wooden tower was built 500 feet from the edge of the cliff but the present light, which replaced the wooden tower in 1857, had to be moved back another 450 feet in the early 1990's as the sea continued to undermine the clay cliff face. The light is still functional, warning sailors of the dangerous shoals in the nearby Atlantic. There is an observation deck overlooking the 125-foot cliff and sea below. We could hear the heavy surf but the observation deck was too far back from the edge to give us a view of the water. Like the lighthouse, the observation deck had to be moved back to keep it from falling into the ocean. Wine, Rum and Gin... Very Interesting! Weather is always a factor when camping and this trip has provided more than enough reasons to watch the weather closely. First, hurricane Irma chased us up the coast and then hurricane Jose threatened on her heels. We watched the forecasts daily and were not too concerned until the Cape was included in a tropical storm watch. That afternoon it was upgraded to a warning, so we decided to cut our visit short and head for the mainland. High wind and rain are no fun for driving a high profile vehicle like the RV. We wanted to get over the bridges and back to the mainland before it made its appearance. But we had one more stop on our Cape Cod itinerary. 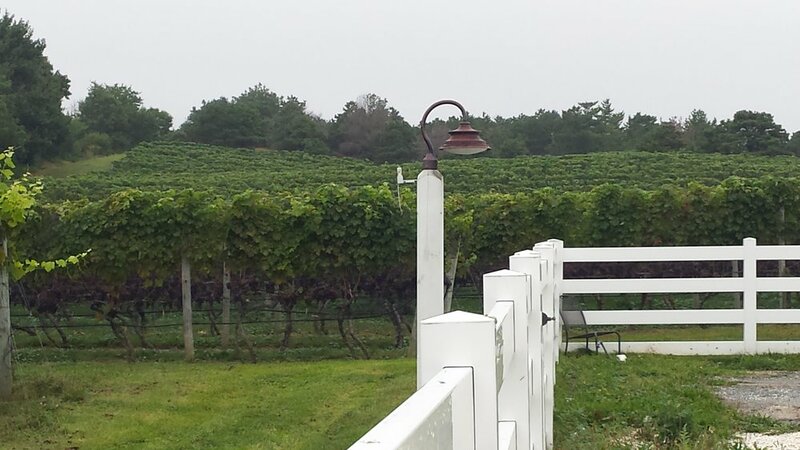 Since we had to drive right through Truro, we decided to stop and visit the vineyard we saw on the way in. It was lovely. Set on a hill, the vines provided a backdrop for the large farmhouse building. Several additional buildings on the property were for processing and harvesting along with a distillery for making rum and gin! So, we could visit a winery and a distillery in one trip. Interesting mix. The literature pointed out that the micro-climate for grapes has produced some good wine here and the gin is distilled from juniper grown on the property. How could we argue? Though the hostess for our wine tasting was less than inspiring as she hurried through her presentation, the wines were pretty good. We picked up a Bordeaux-type red and a bottle of the distillery's gin before heading out for Maine. Always good to pick up a few souvenirs! view our photo gallery for this post!